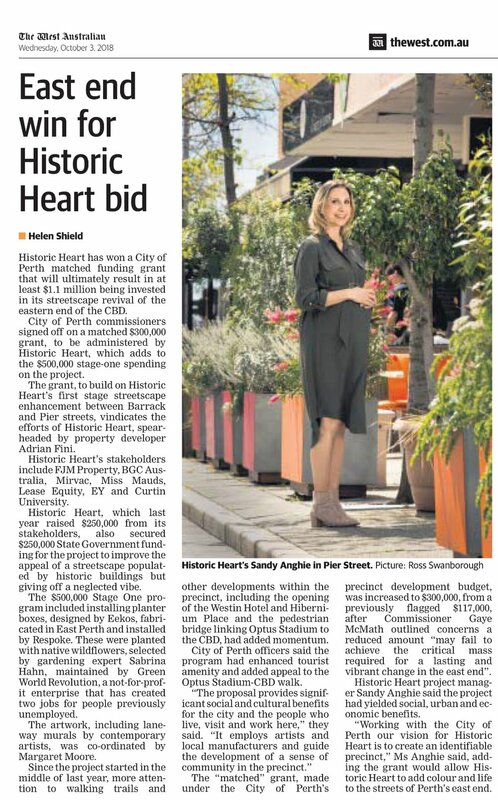 Another milestone for the Historic Heart Project with City of Perth commissioners approving $300,000 in matched funding support to Historic Heart of Perth Inc for stage two of our art and landscape revitalisation initiative in the city's east end. City of Perth chair commissioner Eric Lumsden said the city would work with Historic Heart with the aim of creating a well-designed city space for all people. “The City of Perth’s strategic vision is focused on revitalising urban spaces, such as the east end, that celebrate the city’s natural and built form,” he said. The Stage 1 program included installing planter boxes designed by Eekos Architecture and fabricated and installed by East Perth based Respoke. These were planted with native wildflowers, selected by gardening expert Sabrina Hahn, and maintained by Green World Revolution, a not-for-profit enterprise that has created two jobs for people previously unemployed. The artwork, including laneway murals by contemporary artists, was co-ordinated by art curator Margaret Moore, with urban design input from architect Sharni Howe.